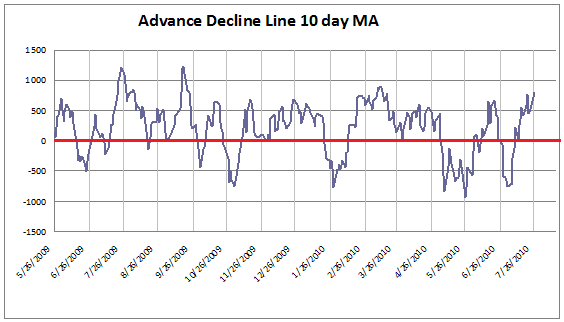 Looking at the chart of the 10 Day moving average of the NYSE Advancers - Decliners may lead one to conclude that we are overbought. That is until one looks at the raw data that goes into calculating it. I highlighted in orange the numbers the moving average will be dropping over the course of the week. Today, a large number will be dropping but for the remainder of the week we will be dropping negative numbers. 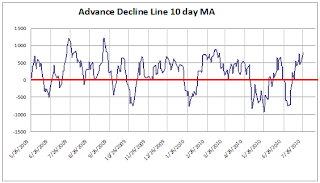 This would imply that we will be maximum overbought at the end of the day on Friday. But because Monday is the first day of the month I am leaning towards waiting until Tuesday of next week before getting bearish.